You may of or may not of noticed but Youwishyou was a little bit quiet over the last few weeks of January. If you're a university student you'll know that it was near the end of this academic year's first semester and for me that meant assessment deadlines and exam revision which I'm not going to lie to you, was stressful. 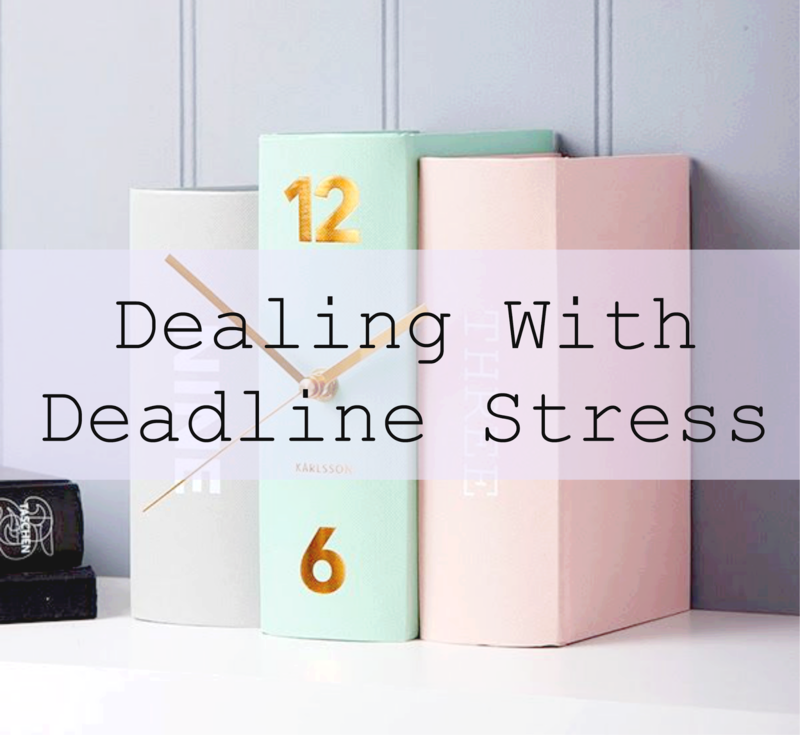 Feeling under pressure can be a horrible experience so I'd like to share some of the advice I gave myself during this period as it may be helpful for someone dealing with deadline stress in the future. During stressful periods in your life it can be easy to want to hide away and not face the issue at hand. Burying your head in the sand won't make any problems go away, if anything it's just better to get them over and done with! It can be really difficult to clear your mind when it is full to the brim of things you need to get done. Try your best to clear it and focus on one task at a time so you can get them each done to the best of your ability. Take the time to get calm, collect your thoughts and it will mean the clarity of your thoughts will benefit for the rest of the day. One of the biggest turn offs for me when it comes to putting my head down and getting on with work is not having a comfortable work space that's free from distraction. Tidy up your work space so it's organised for the task at hand and make sure all distractions are out of sight and out of mind; I always imagine that if I had a gorgeous, big, pretty desk like the ones on Pinterest I'd never leave it. There's absolutely no point putting piles of pressure on yourself during an already stressful time, so ensure that all your goals are realistic ones. Keep in mind that quality overrules quantity so don't worry if you have a smaller 'to do list' as long as the items on that list are productive and achievable, you can always add more once you've finished if you're really feeling eager! There's nothing wrong with bribing yourself with rewards if it means you'll get it done! Stressful periods of your life can feel like they are 'all work no play' situations, so inject a little bit of enjoyment into your busy, stressful routine by rewarding yourself. Have a look at the goals you have in place and think of a suitable reward for completing them. How about treating yourself to a new lipstick if you manage to write 1,000 words of your essay in a day? Don't take your stress out on other people (that's such an unpleasant thing to be on the receiving end of), but do let off steam in a healthy way. Go running, have a girl's night gossiping, even have a cry if you want to, but the most important thing is don't be afraid to talk to someone about your stress. It's something everyone goes through at some point in their life so no one would mind you expressing how you feel and it's good to let go of some of that pent up emotion. Completely agree with all of these tips! It can be really hard to not take stress out on others (mainly my mum and my boyfriend) so I'm going to remember your tip here! Such a fantastic post with some really helpful tips. The best tip I follow myself is to plan out my work and give myself the achievable goals so I'm not trying to cram it all in a short space of time. I really like this post. I'm in my fifth year at uni and i'm still terrible for distractions when it comes up to deadlines, I definitely have to plan my day out and bribe myself to get work done. I usually go to uni and say I can't go home until i've written a certain amount. I only had to stay until 9pm once to get my act together haha. Still working on getting that perfect pinterest working space though! Great post currently feeling rather stressed with all my never ending piles of uni work and it can be hard when you want to also dedicate some time your blog!! You were spot on with saying you should create a good work environment. I was useless at home but at the library or Starbucks I was far more productive!